Air Oasis Air Purifiers Are Maintenance Free For Up To 3 Years! Air Oasis Purifiers have No Filters to Change, No Plates to Scrub, and Require No Internal Cleaning. 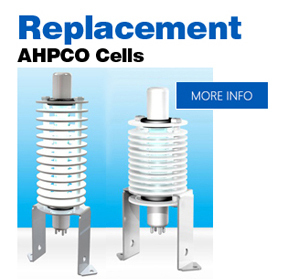 The Only Maintenance Is The Replacement Of The AHPCO Cell Once Every 2-3 Years. A Job That Will Take You 5 About Minutes. Units like the Air Oasis 3000 G3 and others will not only effectively sanitize the air, they will sanitize the nearby surfaces both quietly and efficiently. Proudly Manufactured in Amarillo Texas. Made In The U.S.A.
Why do you say your technology is better than other air cleaners available on the market? 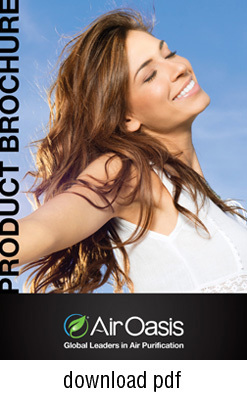 Air Oasis use a proprietary blend of NASA developed photo catalytic oxidation nano technology and Bipolar technology. Tests show up to 99% removal of impurities and carbon-based contaminants. Mold spores, bacteria, VOC’s. They consume a very low amount of energy. Sanitize surfaces as well as the air. Independent lab studies are documented and provided. Does a multiple floor plan call for a unit on each floor? Yes. Smaller units throughout your home will provide better coverage regardless of how many floors. 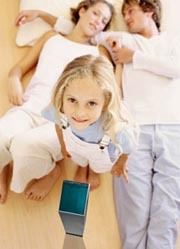 An Induct air purifier is the only way to truly clean multiple rooms/floors with 1 unit. Will the basement require a separate air purifier? Yes, your basement needs it’s own unit. Many basements tend to be damp and dark much of the time. An ideal breeding ground for mold and bacteria. Consider a commercial unit like the 3000Xtreme for basements. What are the colored spots on the air test? Red spots are bacteria. Fuzzy spots show a type of mold. 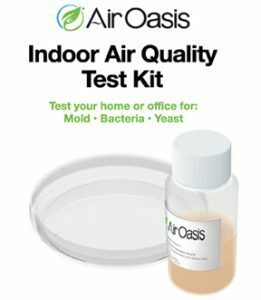 The indoor quality test kits are primarily used to indicate mold and bacteria in a room and and not meant to differentiate between the the different types of mold, bacteria, or germs that are present. Will the unit work with the windows open? Yes and No. A open window on the opposite side of the house will actually help pull the ions through the house and get more effectiveness from the machine. But on the other hand, if all the windows are open or if a window or windows are open near the unit, it will work at a far less capacity. Simply because the advanced oxidizers that are generated by the machine will be pulled out of the house through the windows and wasted. Why does the Mobile Sanifier come with a 1 year warranty compared to the 3 year warranty that comes with the tower air purifiers. Because it is a traveling air purifier. The ” Mobile” nature of the unit opens up it up to variety of abuses that a room air purifier does not typically encounter. Each Air Oasis Model is manufactured to cover a specified square footage. a. 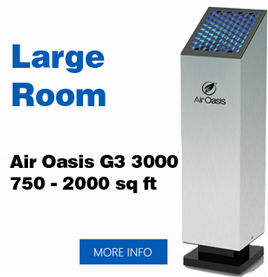 The Air Oasis 3000 G3 covers up to 3000 square feet and is optimal for 1800 to 2000 square feet. It is also recommended for smaller areas with higher contamination. b. The G3 1000 is designed for areas 500 sq ft up to 1000 sq ft.
c.The Mobile Sanifier is optimal for areas 50 sq ft and 250 sq ft. The ion settings on the device make optimal for your vehicle or small room. designed for high contamination in areas 3000 sq ft and less. e. Nano 9″HCT Induct is designated for 3000 sq ft and less. f. The Nano 6″HCT Induct is designed for smaller homes and offices 1000 sq ft and under. g. Nano 14″HCT Induct is a commercial unit manufactured for larger areas up to 5000 sq ft.
h. The 5000 Pro is a very strong commercial air purifier designed for larger areas up to 5000 square feet with very high contamination. I have a Ionic Breeze and it gives off a odor. Does yours? Yes. The odor you smell is ozone. It is commonly compared to an “after a thunderstorm fresh smell” or a slight bleach or antiseptic smell. You can smell ozone at around .01 ppm. The home and room units test well below the Federal limit of .05ppm. for home air cleaners. How is it possible to clean the air without a filter? With the Air Oasis a filter is not needed. The Advanced Oxidizers created by the air purifier will travel through your home and destroy airborne contaminants on site. The oxidizers then revert back to water leaving a fresh air feeling. Any large particles like hair will require a separate filtering device. Isn’t ozone in any amount dangerous? What about UV? A. Air Oasis home air cleaners create a very low level of ozone as a by-product of the UV lamp contained within the AHPCO cell. Well below the Federal Safety levels of .05 ppm of Ozone. Ozone is a very effective cleaning agent at safe levels, but at high levels it is dangerous to the lungs and can be lethal. Like electricity or other potent energies, Ozone must be harnessed and respected to get the best results. This is precisely the function of the Air Oasis A.H.P.C.O. (advance hydrated photo catalytic oxidation) cell. B. UV must also be respected and kept at lower levels. The UV that Air Oasis uses is not considered dangerous. Does the Air Oasis remove cigarette smoke? Yes, The Advanced Oxidizing Ions created by the Air Oasis will break up smoke. 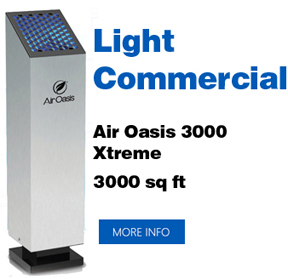 We recommend a Air Oasis 3000Xtreme for smokers and homes with a long history of tobacco smoke contamination. 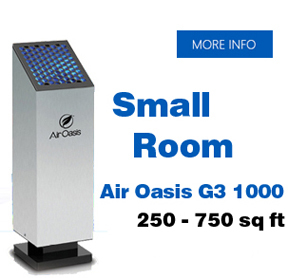 An Air Oasis 5000 Pro or Nano Induct 14″ is recommended to combat smoke in bar/lounge type areas. Does the Air Oasis get rid of dust? AO air purifiers are not considered dust filtering machines. The reason manufacturers of Ionic air purifiers can claim that their units get rid of dust is because the Ions they omit are heavier than dust. When the ions attach to the dust in the air because of polarity, the dust becomes to heavy to float and falls to the floor or surfaces. Air Oasis can make a similar claim. Why does BreatheBetterAir.com not list Nano Induct or Bi Polar AC air purifiers? 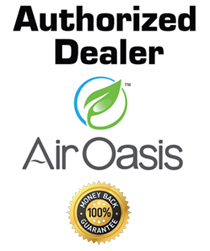 Air Oasis are under agreement to distribute HVAC products through licensed Heating and Air vendors and services alone. This agreement prohibits dealers who are not licensed HVAC technicians to market Air Oasis Nano induct air purifiers through print. 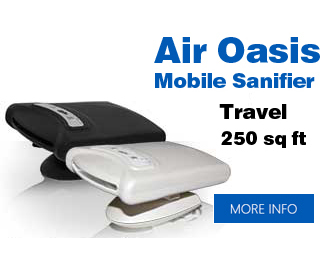 However we can negotiate a price for any Air Oasis product over the phone or email. 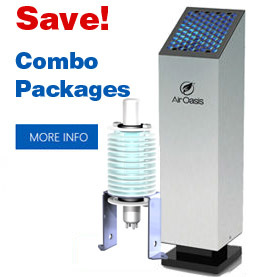 We encourage you to browse Airoasis.com and then phone us @ 806-477-0322 or email us @ info.breathebetterair@gmail.com and let us make you a deal on any Air Oasis air purifier. 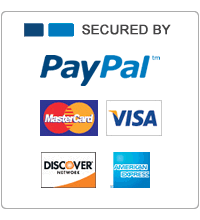 Sorry there are no price breaks for replacement cells or air quality test kits.